Faculty of Education, Thursday, May 30, 2019 at 2:00 pm. Faculties of Science and Health Studies, Friday, May 31, 2019 at 10:00 am. Faculty of Arts and School of Music, Friday, May 31, 2019 at 2:00 pm. Includes All Graduates from October 2018, February 2019 and May/June 2019. Convocation is the ceremony during which your degree will be bestowed and is the culmination of your undergraduate and graduate education at Brandon University. It is a special and dignified occasion that marks the formal recognition of your hard work and accomplishment. Be proud! Convocation ceremonies will take place at Brandon University’s Healthy Living Centre. No invitations or tickets are required for guests. Attention Graduates: Academic attire is mandatory! Caps, gowns, hoods and tassels are available for rent to those graduands attending the ceremony. We encourage you to submit your order as soon as possible — no later than TBA. .Click here for more information. 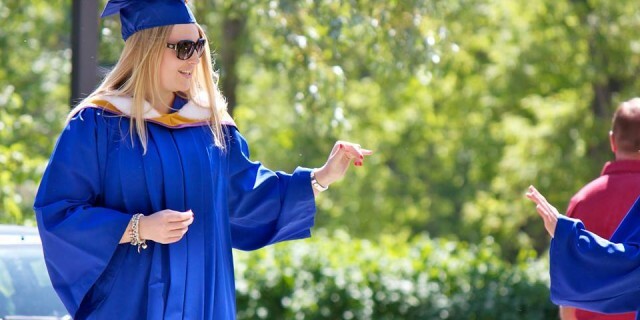 Please Note: After picking up graduation attire, students must meet in the Henry Champ Gymnasium (HLC) ONE HOUR prior to their particular ceremony. All graduates are encouraged to attend Convocation rehearsal in order to become familiar with the location and order of ceremony.